Georgette is a light-weight, crinkled and sheer fabric, displaying an overall bouncy look. 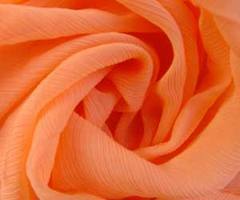 A strong absorbent, Georgette is easy to dye and has dull-rough texture. Georgette is woven in highly twisted yarns of S & Z, in both warp and weft. Georgette is woven in two forms: Pure and Faux. 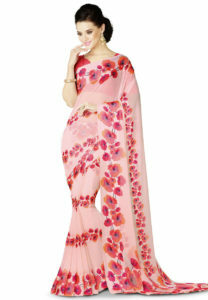 Pure Georgette is woven out of Silk yarns, while the Faux Georgette is woven from Rayon and Polyester. Back in the 20th century, Madame Georgette de la Plante introduced the tenderness of a gorgeous fabric widely now known as ‘Georgette’. The most of its usage has been dated back to 1915. She was a French dressmaker, who like every other French ‘fashion designer’ (as they are known now), was an innovative individual who was well known for her ‘net finish’ of all her gowns and dresses. It is highly believed that the main source of inspiration for this creation was the similar material ‘Chiffon’; Georgette is a more durable and a stronger fabric. It is sheer and comes in both translucent and opaque textures. Usually this fabric gives out a crushed or twisted feel. This effect is very much appreciated as it tends to bring out more of the physique figure of the woman wearing it. Originally Georgette was made from silk. It later included the usage of rayon blends. However, modern Georgette is mostly made with the use of synthetic filaments. The most intriguing part of the making of Georgette is the crepe like twist. It is made with crepe weave by alternating between two ends of the right hand with two ends of the left- hand hard twist yarns. While Chiffon gives a pretty and flowing look, many fashion designers use Georgette for the same purpose, but also for the more conservative crowd that prefers a little more opaque material. Blouses, dresses, saris, gowns and skirts are some of the most common garments on which fashion designers frequently use Georgette. Many fashion designers also use Georgette to adorn and accessorize their designs, due to its highly absorbent nature. Strings, Waist belts, Bows, Scarves, Veils are few to name. Stockings and accessories for slips on is another area of trending designs in Georgette. If what you seek is clingy and flowing, then Georgette is your best friend. With its crepe-like texture and its unusual strength when compared to its counterparts, Georgette is widely favored for springy and lively gowns and dresses. The tendency of the fabric to drape very well makes it an apt choice for many women who love the soft silky yet comfortable look. Due to its thin texture, the Georgette fabric is also light weight and easy to handle. For this reason the fabric is also used as a layer in a larger garment without adding to the weight of the overall costume or giving out a bulky look. It was a very popular fabric in the 1930s for the bouncy effect in the gowns worn by the women of that era. In the modern era, with the development of new machines and easier methods of dyeing, cost effectiveness and other such reasons to reduce overall cost of production of the fabric, Georgette has become one of the most widely sought after textile in garments. Pure Georgette is quite expensive compared to all the variations of the fabric. Traditionally Georgette garments were only worn by the royal families as they were expensive yet elegant. Georgette was the fabric that denoted class and hence most of the initial Georgette gowns were passed down through the ages. Not all Georgette fabrics are the same. There exists a kind known as the ‘faux Georgette’. These can be identified with the roughness of the material. While pure Georgette has a kind of soft roughness, the faux Georgette has really hard roughness to it. Considered to be at least 5 times cheaper than pure Georgette, the faux Georgette can be clearly equated with its price.